With its beautiful art style, tactical gameplay with some unique ideas and a mythological story, God Wars: Future Past seemed like a promising tactical JRPG after playing its Japanese demo. In reality, my time with the full version of God Wars: Future Past was a lot more mixed. I enjoyed improving my tactical strategies in its many truly challenging battles, but paired with imperfections in other areas and the battles themselves, I walked away from God Wars feeling very different to how I thought I would. Still, the 50 hour plus experience was fairly interesting to watch grow, even if it’s not the first tactical JRPG I’d recommend, and saw me in some of the toughest tactical JRPG battles I’ve ever faced, for better and worse. 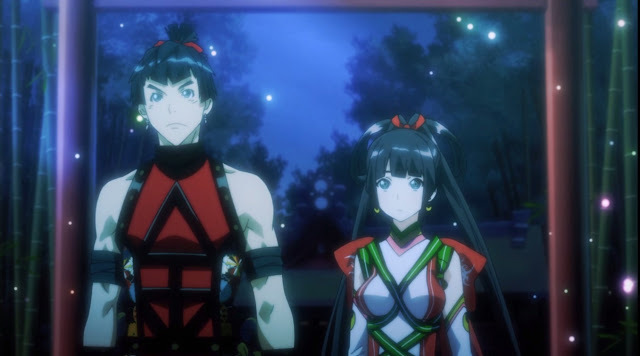 God Wars: Future Past at its core is a tactical JRPG with a story based off Japanese folktales that I’m not overly familiar with, but was interested to learn about. The story is led by Kaguya, a princess who had been locked away by her mother after one of her sisters was sacrificed to bring peace to the Gods. This all changes after Kaguya’s childhood friend breaks her out and the story is based around solving the mysteries of the God’s anger and the disappearance of Kaguya’s mother Tsukuyomi. The tactical gameplay kicks in pretty quickly since Kaguya has guards coming after her at every turn after her escape. These battles take place in typical tactical style on a grid versing armies of various sizes. What makes God Wars unique to the tactical JRPGs I’ve played is the use of terrain height and standing directions to make a realistic increases in damage. Using archers and throwing attacks at higher points or hitting an enemy from behind or the side meant more powerful hits which makes a lot of sense and was sometimes the difference between winning or losing a battle, since God Wars: Future Past’s battles were so challenging. 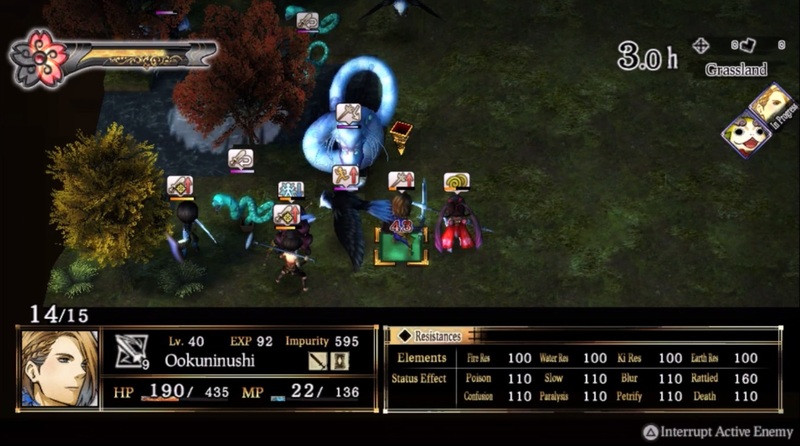 God Wars’ battles generally consisted of victory conditions such as defeat all enemies or a bosses and despite having the same victory conditions, some of these battles were definitely much harder than others. Its many mid-chapter small army battles and side-quests would have one think that God Wars was a simple tactical JRPG where most people with some experience in tactical JRPGs could certainly stand a chance with its smaller armies featuring abilities similar to your own party’s. Its boss battles, however, cranked the difficulty right up to 11 and were some of the most difficult tactical challenges I’ve faced, even on normal and easy difficulties. Some of these bosses were fair and interesting tactical challenges that could be conquered with a better choice of classes and tactics and these were some of my favourite moments in God Wars. Other bosses it felt like the deck was clearly stacked against me, with some battles seeing enemies have class abilities that weren’t learnt by my party for a good while and with the enemy being able to inflict status ailments and damage across the field while my characters couldn’t at the same level, the battles felt unbalanced at times. Along with the difficulty spikes, although grinding was enjoyable enough mechanically, all battles in God Wars can feel a little drawn out, especially in the Vita version where there are added load times between battles. God Wars isn’t really the kind of game you can pull out for a quick 10 minute battle and I found most battles to be minimum 20 minutes. Easier battles felt repetitive regardless of classes, with most battles just boiling down to who had better ranged attacks and didn’t mess up their turns. Difficult battles had potential to go for an hour, regardless of winning or losing. Granted, there are some sweet spots where the high difficulty and lengthy battles give a special feeling of satisfaction reminiscent of old school gaming challenges, especially if I actually won. Most of the battles I lost frequently however I could usually find a ridiculously overpowered enemy field attack, a sudden status ailment chain or overwhelming army size to go with it that made my time and frustration sometimes feel like an unfair waste not worth the lengthy grind time. 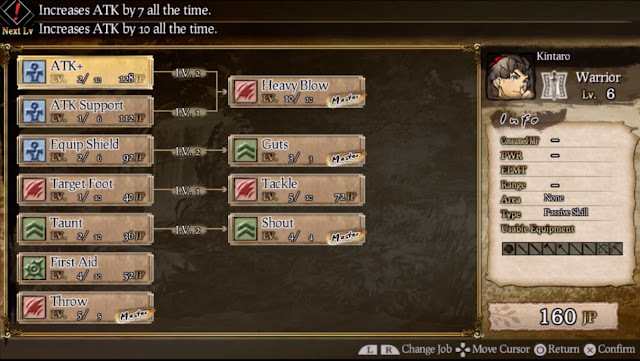 Essential to having a chance at winning God Wars: Future Past’s battles are its intricate skill trees and job system, which I actually enjoyed quite a bit. There are many classes to unlock in God Wars, including magic-based classes like Magician or Spiritualist and physical-based ones like Warrior and Samurai and classes in between, with all characters starting with a standard base class that helps to unlock more Advanced classes as you come to understand how to use them. On top of these, there are each character’s individual classes such as Kaguya’s Mochizuki class that utilises fire skills or Kame’s special class that fittingly takes advantage of his turtle-ness by giving him great protective abilities. I liked the idea that each character had their own skills to build upon with the Main and Sub classes chosen and each buildable skill on the skill tree had pros and cons, such as an increase in MP but also an increase in power to think about. Upgrading my skill trees in God Wars: Future Past took a fair bit of time, but this was a lengthy part I was always happy to put the time into since unlocking the more powerful abilities and upgrading my favourite skills was a fun strategical experience. Speaking of character building, the many strong and visually stunning characters met along the way are all inspired by folklore tales and Japanese mythology. I’m someone who only understands Japanese mythology on a very base level, so I only recognised some names I’d seen featured in other Japanese games and media, such as Kaguya and Susanoo, but a Google search shows that all the characters have some root in Japanese folklore and probably have their own interesting stories to tell. I say probably, as the story most revolves around the story’s main characters such as Kaguya and family, and the few other world leaders and royalty found along the way. This may be for the best as their characters were the more interesting ones, however some of the characters whose introductions I found interesting such as Inaba, Aome or Issun I never got to know more. The story itself follows Kaguya’s journey to find out what happened to her mother and her family and is a enough decent story that takes a little too long to reach its conclusion. There are a few highlights to the story, such as the death of some very big folklore characters that made God Wars’ long battles feel worth it. Other times, most notably after the final boss, the story was let down by an imperfect localisation and sub-par English voice acting. When I played the demo, I didn’t feel the Japanese voice acting was bad at all, so I’d probably recommend that to anyone looking to play God Wars if you can get past the fact the cutscenes have no English subtitles. Despite the English main cast having better voice acting than the other characters, a lot of it either seemed off, whether it be for missing emotion, a strange line or being too cartoon-y. Some of the localisation was very literal and dry too, with some explanations and story moments missing that little bit of Western adjustment to make it not feel out of place. Together, they make a feeling that God Wars’ story couldn’t reach its full potential. I’d actually like to see the story as an anime at some point with all of the lengthy mid chapter defensive armies cut out and just the meat of the story, because I feel like with such a stellar cast of interesting folklore characters, there has to be something more there and I would love to see God Wars’ story actually hit this potential. My initial hope for God Wars: Future Past was that it would be a good Vita game for a little bit of tactical battling on the go. I’ve already mentioned its slight added load time length on the Vita, but if you can get past that it’s not a bad port, minus the one crash I had and having to adjust some of the audio because the level of voices to music was a little odd at times. If you look at the PS4 version compared to the PS Vita version, it does lose some of its painterly look on the battlefield in the PS Vita version with some textures removed. Something that is likely to be in both versions is the camera's tendency to jump behind walls at times, obstructing the vision of the field for a moment. This wasn’t a big issue to me as the occasional anime and comic book style cutscenes still looked fantastic on handheld or TV regardless and they were a true treat when they finally came up. God Wars may be pretty at times, however it does tend to look a little old school and between the other problems I mentioned and its overall feeling of missing its true potential, I’d say it’s okay on Vita, but there are probably better playing and better looking strategy JRPGs on the system. God Wars: Future Past will be an interesting game to look back on in my collection. On one hand, it truly put me through my paces as someone still discovering the world of tactical JRPGs and I will always remember the way it encouraged me to try different tactics and job combinations to try beat the challenges before me. On the other hand, its frustrating challenges with seemingly no end will probably keep me from coming back to it again, especially on harder difficulties. Saving graces like its job system, great ideas in story and use of height in battles would be something I’d like to see in another game someday. I’m happy with the way God Wars: Future Past has likely improved my tactical gaming skills, I just wish it was a smoother time getting there. At least there were two mascot characters though! You can pick up God Wars: Future Past at Play-Asia.com! Did you play God Wars? If so, what did you think? What's your favourite mythology-based JRPG?